Last week I began recounting some of my Summer 2007 backpacking experiences with a description of Crossing Shepherd Pass. Here I’ll continue with another pass from the same trip, New Army Pass. First a bit of background. A few years ago, a previous talusdancers trip took us into the same area. We began that trip at the very same trailhead (at Horseshoe Meadow, south of Mt. 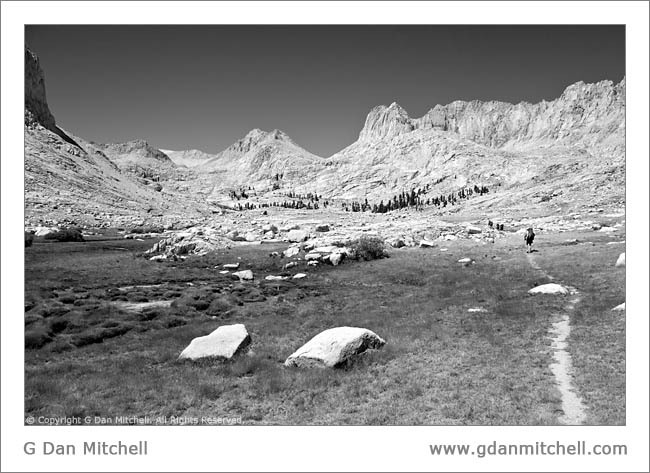 Whitney in the eastern Sierra) and then diverged into the Cottonwood Lakes Basin. We spent several days there, and the highlight of the trip was ascending Old Army Pass to summit Mt. Langley, the southernmost 14’er in the Sierra. At the top of Old Army Pass the trail arrives at the summit plateau, and I was able to see hikers coming in over nearby and slightly higher New Army Pass. 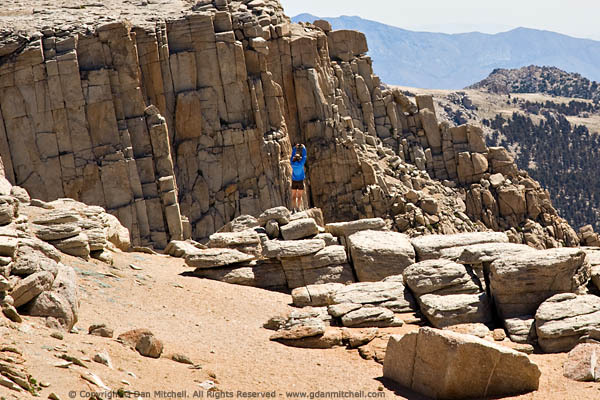 This year’s early-August talusdancers trip was a large week-long route starting south of Mt. Whitney at Horseshoe Meadow, crossing New Army and Crabtree Passes to get get to Crabtree Meadow west of Whitney, and then heading north on the John Muir Trail (JMT) via Wallace, Wright, and Tyndall Creeks, and finally exiting east to Owens Valley via Shepherd Pass. Much of the central portion of this trip in the Kern River drainage is familiar to me from several previous trips, but I never tire of the spectacular scenery in this part of the Sierra. Talusdancers at the Horseshoe Meadow Trailhead. Sierra Nevada, California. August 5, 2007. © Copyright G Dan Mitchell. Our initial plan had been to camp at one of the upper Cottonwood Lakes (Lake 5, if memory serves) near the start of the trail up Old Army Pass, which we would climb on the second day. As we thought more about this we began to consider the alternative of going over New Army Pass instead. We knew from previous trips that the Old Army Pass is not really maintained any more, plus none of us had ever seen the summit of New Army Pass. The latter was the deciding factor – why do the “same old” when something new is available? – and we changed out plans accordingly, taking the left turn toward New Army at the first Cottonwood Lake. The easy hiking continued as the trail gradually ascended toward our goal of Long Lake, at the base of New Army Pass. One notable spot along this trail is an astonishing jumble of glacial boulders filling a huge, relatively flat area between Cottonwood Lake #1 and the lakes closer to the pass. Fortunately, the trail skirts around this very difficult looking terrain, but remains close enough to get a good look at it. We finally arrived at pretty Long Lake, with Cirque Peak and the walls at the upper end of the canyon towering above – we left the trail to walk to the lake at just the point where the real ascent to the pass begins, and we strolled through lakeside trees and meadows (and quite a few other occupied campsites) to get to our spot a bit further from the trail. Morning, Long Lake. Sierra Nevada, California. August 6, 2007. © Copyright G Dan Mitchell. The next morning we arose to begin the climb over New Army Pass. Being the second-slowest person in the group (hey, almost everyone else is half my age!) I got started early, second, and way before the younger members of the party. 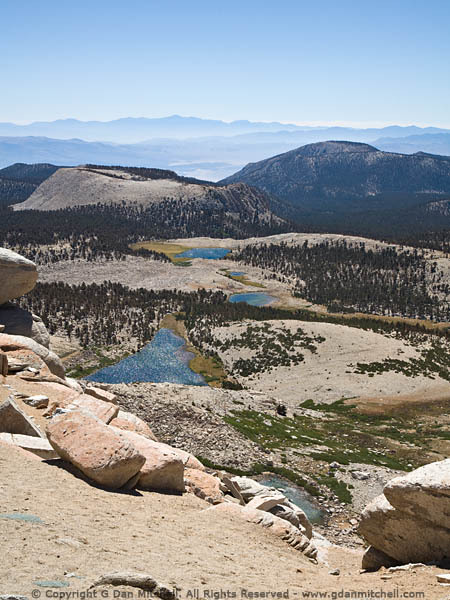 The climb to the pass begins immediately at the lake as the trail leaves the lakeside meadows and trees and cuts directly up into the rocky terrain above. A winding path leads eventually to a flat area where the trail crosses some water, and from here the trail switchbacks continuously to the pass. Compared to the rough, unmaintained Old Army Pass, New Army is a marvel of trail engineering. It is well graded and well constructed; in fact, I’d say that it is by far the easiest 12,000’+ Sierra Pass I’ve ever climbed. 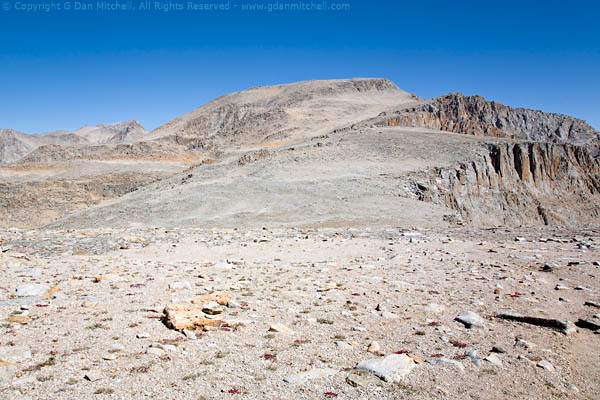 Eventually, after many long traverses, the trail winds a bit to the right and up via shorter switchback sections and reaches the broad, flat summit of the pass. Looking East from New Army Pass. Sierra Nevada, California. August 6, 2007. © Copyright G Dan Mitchell. The ridge itself is quite flat, and it was easy to walk either way along its length. Summit Ridge Near New Army Pass. Sierra Nevada, California. August 6, 2007. © Copyright G Dan Mitchell. Below, over a very easy slope, we could see the point where Old Army Pass emerges from the gully onto the low point on the ridge between New Army Pass and the Mt. Langley massif, with the tip of Mt. Whitney just visible beyond. Far to the west is the Great Western Divide and (I’m pretty certain) the area around Franklin Pass. All of the terrain visible from here is very high and alpine – virtually no trees are visible at all. Mt. Langley, From New Army Pass. Sierra Nevada, California. August 6, 2007. © Copyright G Dan Mitchell. Finished with our rest and snack break, we started down from the pass. The first section descends over smooth, open terrain towards the low area between New Army Pass and the ridge’s rise toward Mount Langley. (The “trails” to Langley are clearly visible from this area.) Our trail paralleled the Old Army trail for some distance, though they are quite close together – eventually they merged. Before long the trail began to drop quite steeply into a valley heading toward lower terrain west of the pass. It would be a lot more work coming up this trail than it was descending. Our plan was to head toward Miter Basin and Blue Sky Lake, where we would camp for the night in preparation for crossing Crabtree Pass the following day. 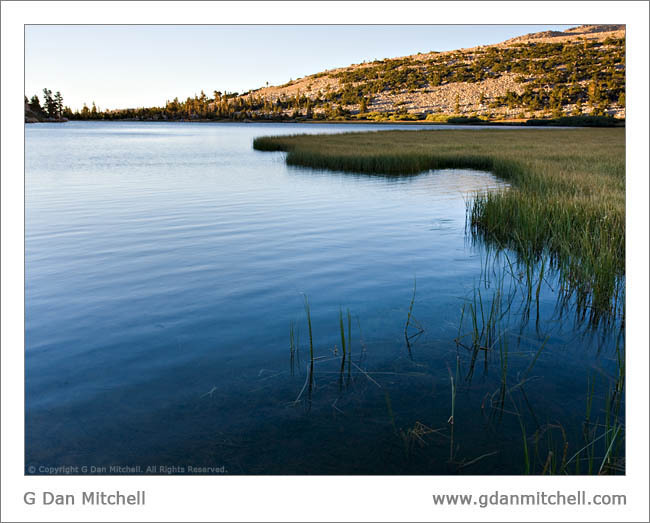 Since one member of our party planned to leave our group at Soldier Lake (and return to Horseshoe Meadow via Old Army Pass and Cottonwood Lakes), we took the turnoff to that location rather than continuing on down canyon to the stream emerging from Miter Basin. This seems to be another popular destination, and there appeared to be quite a few parties camped there. After lunch we left him to set up his camp and then walked a bit further along the left side of the lake. Eventually we came to a steep break in the cliffs which afforded a way to the top of the ridge and then into Miter Basin. At the top of this short but quite steep climb (along a route that is obviously used frequently) we came to the top of the ridge and could look down into the Miter Basin drainage where the “normal” route ascends from the left. Rather than dropping into the basin and then having to regain our elevation, we contoured to the right across easy terrain of open forest and rocky slabs until we finally met the creek a good distance up the canyon. Here we picked up an unmarked trail that took us up the canyon, joining the use trail well below the point where the steep final climb to Blue Sky Lake begins. Entering Miter Basin Below Blue Sky Lake. Sierra Nevada, California. August 6, 2007. © Copyright G Dan Mitchell. Though it was obvious where we had to end up, the best way to get there was not always obvious as we climbed this rocky section of the route. We finally emerged just to the left of the outlet stream, only to realize that we really needed to be on the right bank, beyond which there were a number of campsite possibilities. We quickly negotiated this crossing, passed by another party camped on the high point here, and found our own campsite above the lake behind a sheltering cliff wall. 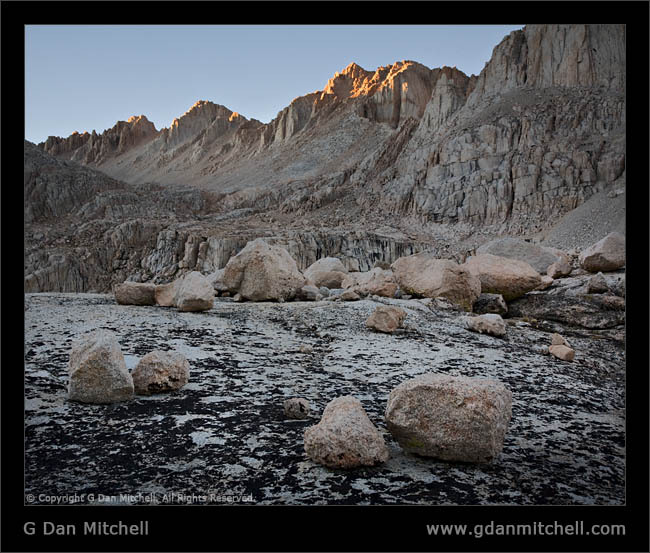 Last Light, Miter Basin. Sierra Nevada, California. August 6, 2007. © Copyright G Dan Mitchell.